Idle Women! How delightfully un-PC, but who were these Idle Women and what are they to do with canals? During the Second World War National Service for women began in 1941 when those who were not married or in some essential job, had to volunteer for war work. In 1942 an advertisement was placed in the national press by the Department for War Transport, asking for volunteers to work on the waterways. No boating experience was demanded, but young women who applied had to be ‘of robust constitution’ according to a quote from 1944. Those who answered the advertisement found themselves, after six weeks’ training, operating the boats which each carried up to 50 tons of essential supplies along the nation’s waterways and became the so-called ‘Idle Women’. The nickname, derived from the initials IW on their badges, standing for Inland Waterways, actually came from the eponymous title of Susan Woolfitt’s Book, at the time they were usually referred to as The Trainees. – Women they were – but idle they were not. There were three women to manage each pair of boats who often worked an 18- to 20-hour day, after initial training, they might be transporting loads from the London docks to Birmingham; then they would cross to Warwickshire to collect coal and take it back to London. After a round trip of some three weeks, they had the option of a week’s unpaid leave. 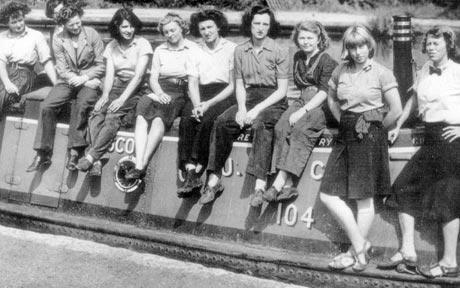 Between 1943-46 many women, aged from 18 to about 35, worked on the canals and waterways of England. No one is certain how many Trainees there were but Mike Constable has over 90 names on his database, although not all completed the training. One of the Trainees, Olga Kevelos, lived for many years before her death in 2009 at Kings Sutton. The Mikron Theatre, produced a play, Imogen’s War, written by Mike Lucas and Sarah Parks of Mikron, using material drawn from half a dozen diaries and books written by the women themselves. Not to be confused with Isobel’s War written and performed by Kate Saffin. Thanks are due to Mike Constable for much of the detail above, Mike is in contact with the five known surviving Trainees on a regular basis and gives talks on this subject. He has also advised the BBC on all of their recent programmes on this subject.